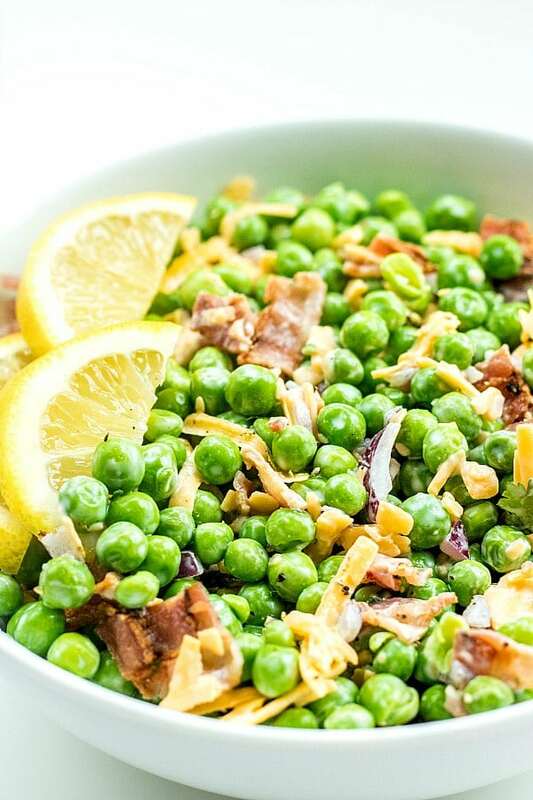 Creamy Bacon Pea Salad - Home. Made. Interest. 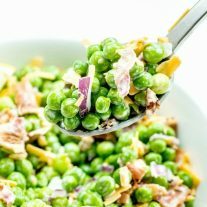 Creamy Bacon Pea Salad is an easy spring or summer salad recipe filled with fresh English peas, crunchy red onions, salty bacon, and shredded cheddar cheese tossed in a creamy dressing. 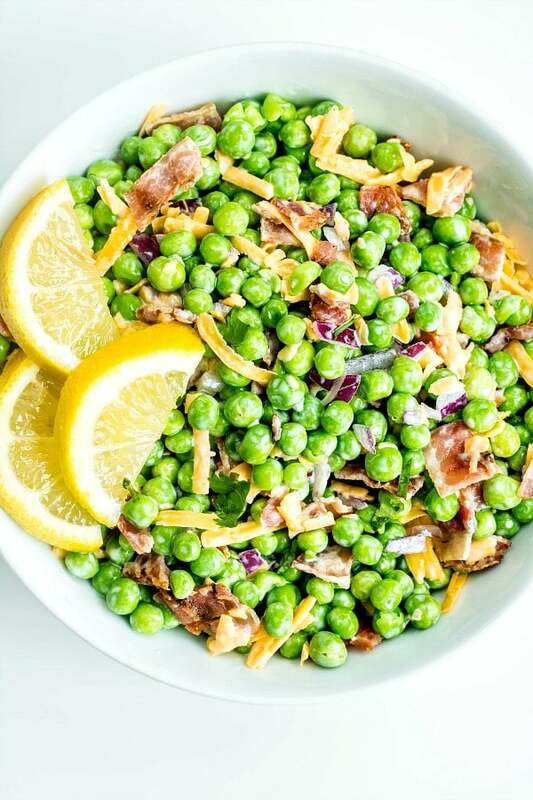 Spring is in the air and I’m in the mood for light, bright spring and summer recipes made with fresh ingredients and lots and lots of flavor This Creamy Bacon Pea Salad is a classic side dish that make an awesome Easter side dish and a great side for summer potlucks. You can make Creamy Bacon Pea Salad in just 15 minutes and serve it with anything from Easter ham to Chipotle Dry Rub Ribs. This Creamy Bacon Pea Salad has it all, fresh English peas, smoky bacon, cheddar cheese, and a creamy, flavorful dressing that brings the whole dish together. The best thing is this amazing side dish doesn’t require any cooking…well except for the bacon but you can make that ahead of time, use microwaved bacon, or even use the store bought real bacon bits to save some time. 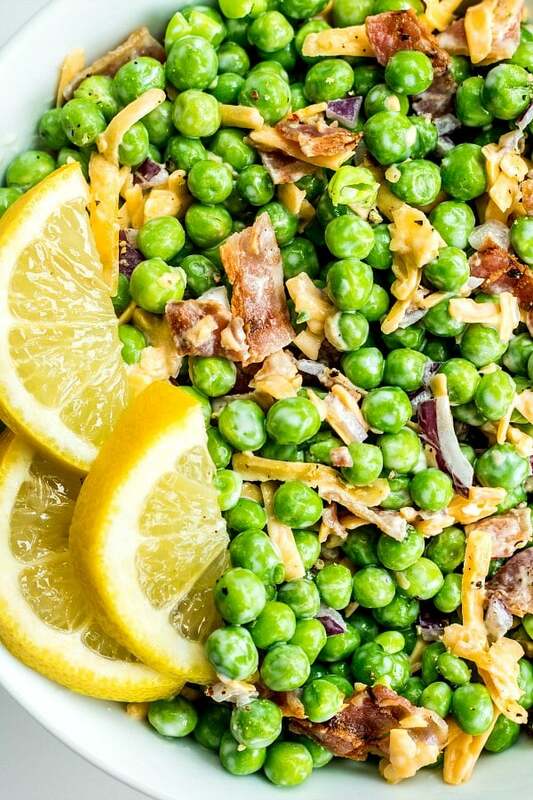 Do I Cook the Frozen Peas in Creamy Bacon Pea Salad? No cooking required! Take your frozen peas out of the freezer about 15 minutes before you’re ready to make your pea salad and pour them into a bowl. Let them begin to thaw while you prepare the dressing. Using frozen peas that have not been warmed up will help the peas keep their shape when you toss all of the ingredients together. The key to bringing the whole dish together is the dressing. It is made with mayonnaise, sour cream, and a little apple cider vinegar to add a little tang. You mix all of it together and pour it over the peas, bacon, cheddar cheese, and red onions before tossing everything together gently. Once the pea salad is made you can serve immediately or put it in a sealed container in the refrigerator until it is ready to be served. If you want to add a little more flavor give the whole thing a squeeze of lemon before serving. It brightens up the whole dish! Want more easy side dish recipes? Put frozen peas into a large bowl and let them sit for 10 minutes to begin to thaw. Add red onion, cheddar cheese, and bacon. Make the dressing by combining mayonnaise, sour cream, apple cider vinegar, and salt in small bowl. Pour dressing over the peas and toss everything together gently. My kids go crazy over this recipe! I think the dressing and cheese make the dish! So yum! Such a delightful spring recipe! I always have a bag of frozen peas in my freezer and with such a short ingredient list I can make this anytime. Bacon & Peas! Two of my favorites and they were together in this scrumptious side dish. I can’t wait to make it again for an upcoming picnic we are going too. Delish! 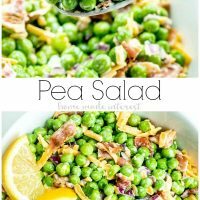 This creamy bacon pea salad was fabulous! I loved how quick and easy it was to assemble, and how everyone went back for seconds. This is one recipe I’ll be making again and again! This has made my mouth water! Yum! !